Every now and then, you hear about a book by an author you’ve heard of. The book has a great title, gets good reviews, and is generally well-received. You see it on Amazon, but the price is a little higher than you’re willing to pay. So you decide to wait until it goes on sale. Then it goes on sale. You buy it. You start reading it. And you wish you’d just kept on waiting. That was my experience with The Hundred Thousand Kingdoms by N.K. Jemisin. Kingdoms takes place on an alternate Earth, where… well… 100,000 kingdoms are led by the Arameri family, who lives within a Space-Needle-like palace called Sky. The current leader of the Arameri, Dekarta, is getting on in years and wants to pass the mantle of leadership to one of his full-blooded Arameri heirs, Scimina and Relad. But there’s a third Arameri heir, Yeine, warrior-princess of the far-off land of Darr — and the main character of Kingdoms. Brought to Sky by Dekarta, her grandfather, she finds herself embroiled in a power struggle for the leadership of the Arameri — and the entire world — as she becomes increasingly aware of exactly why she was ordered to Sky in the first place: the Arameri want her to die. Young woman comes to town and is suddenly the most important person there. Supernatural creatures try to recruit young woman to their side. Young woman turns out to have some sort of connection to the supernatural creatures. In this case, the creatures in question are the gods of the planet — Itempas, Nahadoth, and Enefa, roughly corresponding to God, Satan, and Eve/Lilith. Nahadoth lives among the Arameri; Itempas appears when the Arameri passes leadership on to the next heir. Unlike the real world, these gods actually provably exist, and can do godlike things. There are others, including the childlike Sieh, but it’s really all about Nahadoth. Once Yeine gets situated in Sky, the story turns into a fantastical soap opera, with plots and counterplots, and in the middle of it all a single character who things just seem to happen to. Yeine does act upon her environment, but usually not until the environment has acted upon her. To go back to my comment on storytelling style — the best way to explain it is that I felt like I was reading Anita Blake: God Hunter. The same problems I have with Laurell K. Hamilton’s storytelling, I had with Kingdoms (although this book was well-edited, whereas some of Hamilton’s novels unfortunately contain grammatical errors and spelling inconsistencies). I also didn’t really care for the digressions into Yeine’s dreams about what the gods were doing, or had done. They didn’t hold my interest. There is an unexpected twist at the end — I’ll give it that — but unfortunately I felt as though the amount of talking and exposition that came right after, to support the twist, lessened its effect. Despite my problems with the tropes and the style, I did find the main characters to be well-rounded and interesting. Even though I didn’t really like Yeine, I was on her side throughout the whole story. In the afterword of the digital copy of the novel that I read, an interview with the author indicated that Yeine was a version of herself taken “to the extreme”. I’ve never met or spoken to the author, but I’ve written enough stories with “a version of myself” as the main character that I saw the hallmarks of it, and they drew me out of the story a little. But despite that, I still wanted her, maybe if not to win, then to at least not lose. Some of the villains felt a little flat — and one of the characters who betrays our heroes, I don’t think I really had enough clues to appreciate the level of betrayal — but I was pleased with the sheer level of detail and attention paid to the main players. Especially Nahadoth and T’vril. I found T’vril to be the most relatable character in the story, and Nahadoth the most interesting. In fact, Nahadoth is really the character I think most people will be rooting for — bound by the Arameri, he nonetheless finds ways to rebel. I watched Watchmen last night, and I found myself drawing parallels to Dr. Manhattan’s immense power and his battle to control it for the people he cared about. 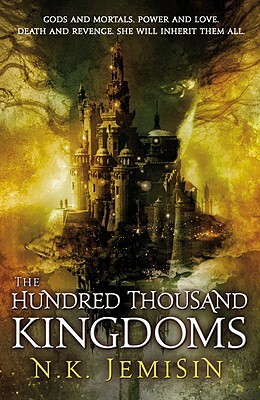 The Hundred Thousand Kingdoms is the first book in the “Inheritance” trilogy, according to the cover. I’m not sure I’m going to read the second book anytime soon, but I think the first one was well-received enough that the sequels will be enjoyed by those who liked Kingdoms. Unfortunately, I didn’t really care for the book that much. Despite the author’s clear talent and ability for worldbuilding and characterization, the story didn’t hold my interest — possibly because, at least in my mind, it didn’t bring anything new to an oft-told tale of a young warrior-trained woman upon whom rests the fate of the entire world. Note to Parents: This novel contains violence and a couple of sexual situations, one explicit. Mature teens will be able to handle it; younger ones may become distracted by the imagery. Of course, you should use your own discretion when it comes to your children.